I bought some lovely fabric from Spotlight a few months ago with the intent to make Elijah a quilt. It sat in a pile with all the other material that was intended for quilts until I realised it would make a much nicer pram liner than a quilt. I have a Baby Jogger City Elite. When we purchased it I really wanted the green, but the stone was on sale. Compromise? Make a green liner! It was so easy to make; I drew a template from the pram, cut out two pieces of fabric and a piece of polar fleece, sandwiched it together, sewed button holes where the straps come through, then edged it all in bias binding. I made a little lap blanket with the leftover fabric. It’s just backed with polar fleece to make it nice and snuggly. As you can see, Elijah is quite excited and read for winter walks… whether I’m ready for Winter walks is another story altogether. I made a little pledge with myself a month ago to stop worrying about making things 100% perfect. The need for perfection was stopping me from making anything at all. Yes this liner has little imperfections, but it’s done and it’s one less pile of fabric in the stash. How clever you are! And how fast the little guy is growing! Thank you! Yes, he’s crawling all over the place now. I turn my back and he’s off in another room! Love, love, love…. I know I told you already but LOVE! 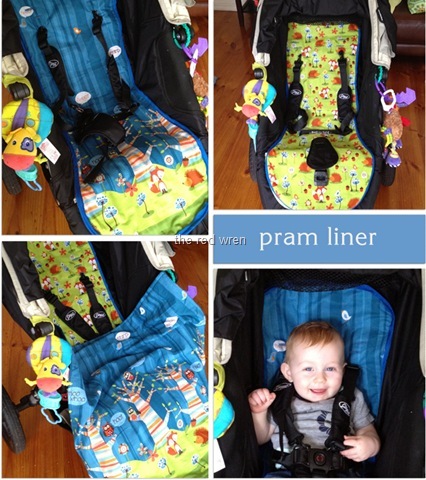 I’ve just randomly come across this whilst searching for pram liners online – LOVE it! Just fantastic :) And who cares if it’s not perfect, nobody will know except you! Great fabric. You wouldn’t still have the pattern and be willing to share would you? I have the same problem but our pram is red (last one available!!) and I hate it!!!! Hi Leah – I threw it out only recently sorry! It’s really easy to do though – I just laid baking paper in the pram to get the rough shape, cut that out, then modified where possibly. Thanks Sweet, that is what I had planned to do, just thought if someone had one already done it might save me a little effort – I’m lazy!! !